Located at the southern tip of Vancouver Island, Victoria is the capital city of British Columbia. Boasting a population of 326,010 it is the Island's largest metropolitan area. 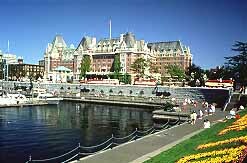 Enjoying one of Canada's mildest climates, Victoria is also known as Canada's "Best Bloomin' City". In Spring the streets are lined with blossoming trees, and in summer baskets brimming with flowers are hung on the 19th-century street lamps. Victoria's Inner Harbour bustles with marine traffic bearing cargoes to far-off places and visitors to Vancouver Island. Harbor cruises, fishing charters and whale-watching abound. Three resident pods of killer whales frequent the waters here. Car and passenger ferry service to Seattle is provided by Victoria Clipper. An excellent guide to visitor attractions is maintained by the Admiral Motel.